WR3 with TEAM Clutches: The latest technology in low gearing is ready to hit the snow. For 2016, we are introducing the Wide Range 3 (WR3) speed transmission with easy shift, raising the bar on how low gearing can go. Inside sits a large TEAM BOSS driven clutch and TEAM drive clutch. By eliminating belt skid, these clutches reduce temperature and transfer more power to the track. In addition to their incredible strength, these clutches are known for their easy and precise tuning. Arctic Race Front Suspension with Arctic Cat Gas IFP Shocks: Our uniquely wide A-arm spacing complements the chassis design, which allows us to maintain a tighter suspension. Arctic Cat® Gas IFP shocks feature a hard-anodized aluminum body, 0.5-in. shaft, aluminum internal floating piston and high-quality seals and ice scrapers. For added strength, the eyelet on the shaft end is forged, replacing the welded design. XTRA-ACTION Rear Suspension: This wide track employs the all-new articulating rear suspension. Articulation allows the rear of the suspension to move up and down as you ride across rougher snow. It also makes your machine more maneuverable. When backing up, make sure you’re in the unlocked position. This allows the rear of the frame to lever up, rather than dig into the snow. When you want more traction, lock the skid and you’ll have a straight-rail suspension that takes full advantage of the 154-in. track. ProUte - 10/8 Skis: Ten inches at their widest, tapering to 8-in. 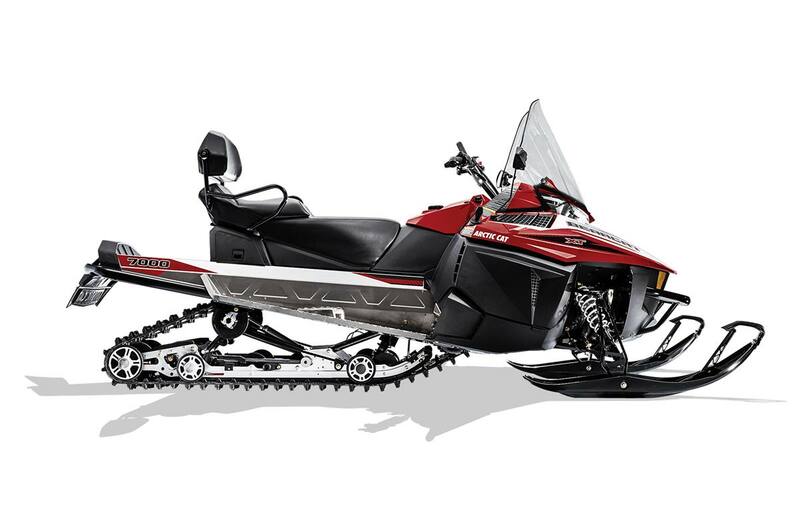 The tipped-up design allows you to run on deep snow without trenching. Whether you’re working or touring, these skis provide effortless stability on or off trail. Wide Range 3 (WR3) Transmission with Easy Shift: You’ve got the power. You’ve got the strength. Now you have Wide Range 3 with Easy Shift. Nobody goes lower than this. Shift into super low and you’re off with no track spin. A gear ratio this low was previously unheard of. When venturing out into deeper snow, the risk of getting stuck is virtually nil. Put all 135-class HP to work, utilizing the gear that’s right for the conditions. Adjustable Mountain Handlebar: The adjustable mountain handlebar allows you to rotate the bars in the riser block. That grab strap is there for when you need some extra leverage. 20-in. Wide Track: For towing, touring, grooming or patrolling the ski slopes, the 20-in. wide track, with patented Quiet Track technology, gets the job done. The hardworking articulating rear suspension benefits from a long 154-in. track featuring 1.375-in. lugs and a 2.86-in. pitch. Power Sport Gauge: All the info is at your fingertips. There’s an odometer, trip meter, speedometer, engine hour, clock, fuel level indicator, reverse, optional altimeter and warning lights. Push-Button Reverse: The push-button reverse is all about quick, easy activation. Go forwards to backwards and back to forwards in seconds. Backup Light and Pivot Tow Hitch: The backup light Illuminates the space behind you and lets other riders know you are coming toward them. The pivot tow hitch uses a tow ring configuration to secure a hook to that loaded sled or fish house. Utility Front Bumper: You’re here to do work, not dance a ballet. The Utility Front Bumper protects your machine and gets the job done. Mirrors: These heavy-duty, built-to-last mirrors are perfect to withstand harsh winter elements. Plus, they help you keep your eye on your posse. 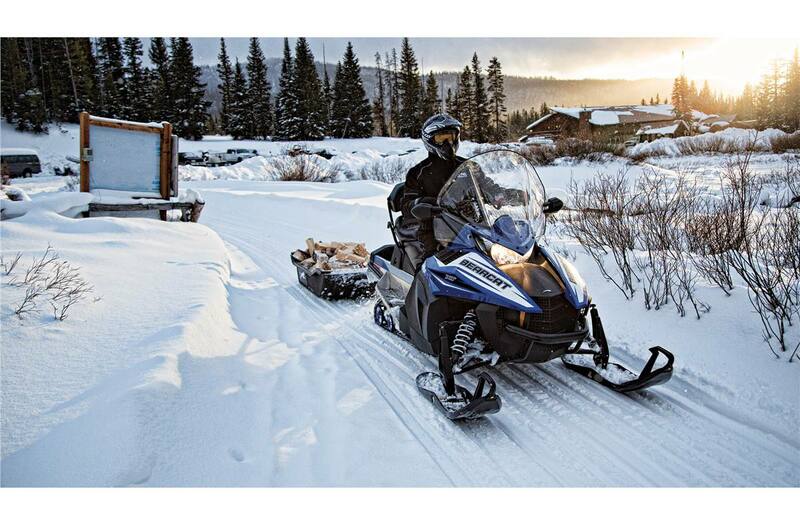 19" High-Height Windshield: The extra-high windshield tames the wind out in the great white open. The mirrors make backing up easy. 20 in. x 154 in. x 1.375 in.